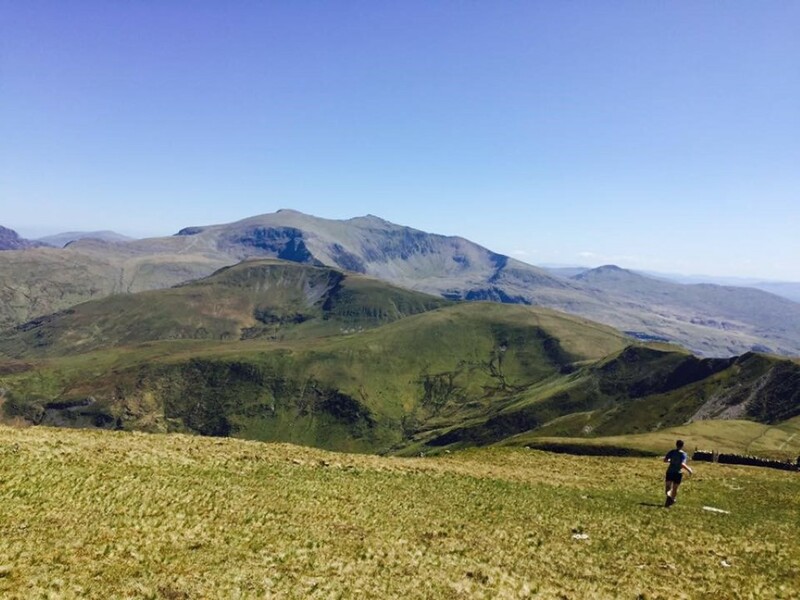 This race is one of the longest established fell races in Snowdonia, over 40 years old, an absolute classic, taking in the range of hills near Llanberis towards, but short of Snowdon – a horseshoe of around 9 miles. This year was a real occasion, as it was a counter in three different championships – north wales and welsh championships, and also the Inter-counties fell championships. This meant that there were around 300 runners from around the UK, a lot of them representing their counties in teams of four. I had been looking forward to this race after a rare race free weekend ; being fit and able to run up and down mountains in Snowdonia is a privilege, and to do this in the company of other mad hill runners an amazing experience. Travelling to Snowdonia always feels like a little holiday to me, and meeting Simon, Hayley, and Andy in Mold with Andy dressed in flip-flops and shorts made that even more so, with the bright blue skies and warm temperature also helping. Arriving very early (last minute panic of realising there actually was pre – entry, with a lot of places already taken), we registered at Electric Mountain, admiring the entry list of the county team members, with many of the well known (in fell running circles anyway) fell runners at the top of their game in UK fellrunning present. This was going to be like lining up at the start of a race with Usain Bolt, Mo Farah and Jessica Ennis – Hill. Wandering through Llanberis we caught up with the other Buckley Runners enjoying the sunshine, and browsing the specialist outdoor shops (note – never go shopping with Andy, I thought I was indecisive until I saw how long it took him to decide on which hydration vest to buy ! ). It was good to see Dawn and Steve back on the hills again after various injuries, and Pete, John, Simon, Hayley, Andy too. Ice creams and alcoholic drinks would have to wait until after the race we decided, though it was very tempting. The race start is a 5 minute walk from town – usually there is about 50 to 100 runners in this race – this year there were 300 runners on a narrow road leading up to the first climb up Moel Eilio so the first mile, steadily up hill, didn’t feel too bad as we jostled with each other to try to get some space to run. It didn’t take too long to spread out, and at the end of the track a sharp left turn led on to the slope of the first climb up Moel Eilio, where the front runners started to pull away from the rest of us, becoming smaller and smaller towards the summit of the first climb. Looking over to the right we were rewarded with sea views, and to the left a reminder of the three hills we yet had to run over. The rest of the route is a real rollercoaster – at the top of Eilio, it goes a little bit higher, (just when you think you have reached the summit), then a sharp descent, steep ascent, another sharp descent, then the last climb up Moel Cynghirion. At this point you get the best views of Snowdon, and the whole Snowdonia range – conditions on this day were probably the best I have ran in Snowdonia with views for miles. After this last lung busting climb, there is a brutal descent – no other word can describe this, there is no real path, as no walkers would ever choose to go up or down via this route. It is straight down towards the welcome sight of marshals far below ; trying to find the best and safest way down through rocks, grassy tufts and just coping with the steepness of descent without turning your ankle. After this descent there is a stream to cross (knee deep) then up a short sharp climb on to the Maesgwyn path. Though this feels close to the end, it is a two / three mile run in, and after the sharp climbs and descents, running on this rough rocky path was tough, with a need to lift weary legs high to avoid catching them on rocks and coming a cropper on the way back to the finish. All too soon, there was a turn off on to the path which led down to the campsite above Llanberis, the finish of the race, and a paddle in the river to help with muscle recovery. The winning Yorkshire team were having their photos taken, and looked like they had just been round for a jog, with the Cumbrian ladies all coming in not far after. The smiles on our faces weren’t just put on for the camera, everyone coming in seemed to be buzzing and to have really enjoyed the race, sense of occasion, and looking forward to the post race pint and ice cream. 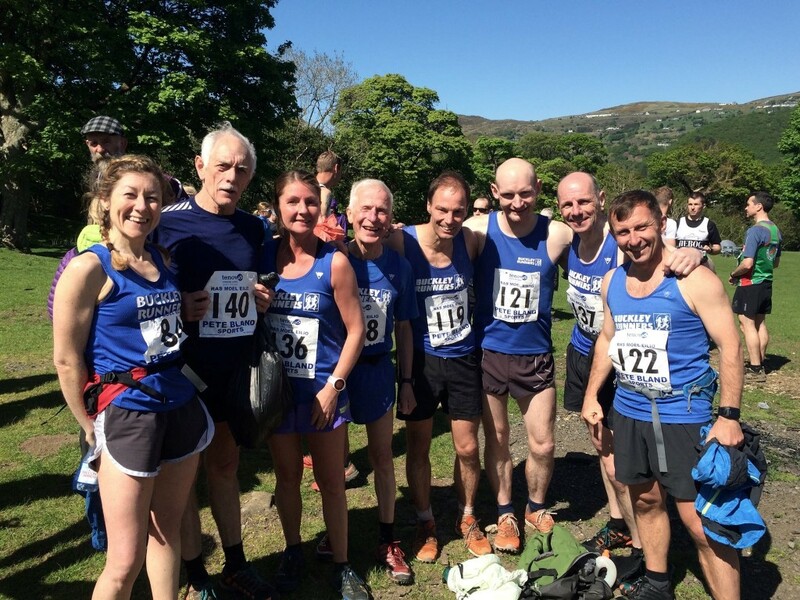 I wouldn’t recommend it as a first fell race to do, but if you have ran up a few hills, feel fit enough to walk up the climbs (most of us do) and want to run in amazing scenery, come and give it a go next year !